Weddings are one of the first and most powerful outward and visible signs of the grace-filled commitment two people make together in marriage. At St. Thomas we are happy to help you prepare together to make this commitment and ask for God’s blessing upon it and the support of a community around it. 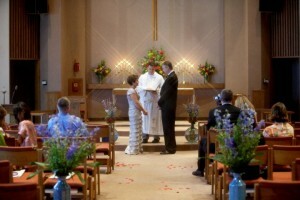 For more information about marrying at St. Thomas, please contact our clergy through the office at 913-451-0512.